In this tutorial we’ll focus on setting up our shop – you can learn more about shops in general in this how-to. First, we’ll create a Shop Layout – it’s similar to Menu Screens and is used to display the contents of a shop. Open the ORK Framework editor and navigate to World > Shop Layouts. We’ll change the default layout. 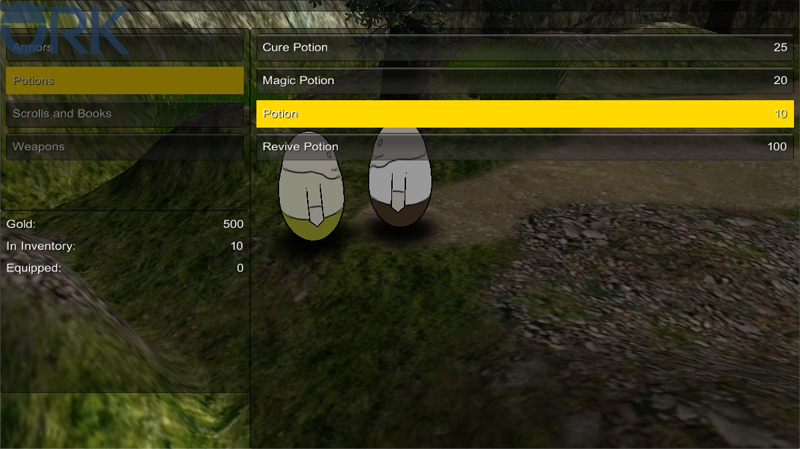 The item types and item list will be displayed in separate boxes at the same time. The name box is used to display information about the shop (name, description, icon). The buy/sell box displays a choice if the player wants to buy from the shop or sell to the shop before displaying the shop’s (or player inventory’s) content. The rest of the buy/sell box settings should already be set up correctly. There need to be three buttons, a buy button, a sell button and an exit button. The type box allows separating the content of a shop into different item types. The list box displays the actual list of items and equipment sold in the shop (or that can be sold to the shop). The description box displays the description of selected menu choices (e.g. the description of an item). The info box can be used to display general info using text codes. You can use it to display the amount of money owned by the player, or the quantity the player has in his inventory of a selected item. Displaying information works like Information menu part in Menu Screens, so we can use HUDs or HUD elements to display information. Click on Add Information Element to add a HUD element. Copy the element and change the following settings. The combatant info box can display status information about combatants. You can use it to show the changes a selected equipment would make to a combatant’s status. And that’s it for the shop layout. A shop is simply a list of items and equipment that is available in the shop. Navigate to World > Shops and change the default shop’s settings. Since you can have multiple currencies in a shop, you can select a currency the shop will deal in. The player and camera control will be blocked while the shop is opened. A shop can optionally play a different music when opened. We’re not using this feature. You can define the items that will be sold in the shop here. We’ll add all items (excluding the quest item Underpants) to the shop. You can define the weapons that will be sold in the shop here. Again, we’ll add all weapons to the shop. You can define the armors that will be sold in the shop here. We’ll add all armors. And that’s it for the shop. Our shop layout uses the default Quantity Selections, but we haven’t set the up yet. A quantity selection is a dialogue that lets you select the quantity of an item (e.g. when buying from a shop). Navigate to Menus > Quantity Selections and change the default quantity selection’s settings. You can define the text displayed in the quantity selection here. There’s a separate text for the top and bottom of the dialogue, and a quantity text that will be displayed between the quantity change buttons. This will display the item’s name in bold, yellow text. This will display the quantity (%) and maximum quantity (%m). The maximum quantity is determined by the amount of available items or money. Price: %t.Add a line with at least two spaces below the price text to add an empty line below the text. This will display the total price of the selected quantity (i.e. price * quantity). You can define the quantity change buttons here. There are horizontal and vertical buttons available. We’ll use both horizontal and vertical buttons. The horizontal buttons will be displayed left and right of the quantity message. You can also use the horizontal keys (defined in the Game Controls) to change the quantity. When using the horizontal buttons/keys, the quantity will change by 1. When exceeding the end of the quantity (i.e. 1 or the maximum value), the quantity will loop to the other end. The quantity buttons will use the button layout of the GUI skin. The vertical buttons will be displayed above and below of the quantity message. You can also use the vertical keys (defined in the Game Controls) to change the quantity. When using the horizontal buttons/keys, the quantity will change by 10. And that’s it for the quantity selection. Click on Save Settings and close the ORK Framework editor. Open the town scene (1 Town, can be found in Assets/Tutorial Resources/Scenes/) and add NPC_yellow in the Backyard area (you can find the prefab in Assets/Tutorial Resources/NPCs/). Change the following settings in the shop interaction’s inspector. We don’t need a faction for our shop, the prices wont be influenced by faction benefits. You can ignore the shop’s Scene ID – it would be used when we’re saving the shops content (e.g. when using quantity limits for the sold items, or keeping track of the items sold to the shop). The scene ID you’ll see in the inspector is automatically generated, but you can change it to your liking (if you’re using the shop saving features). Shops sharing the same scene ID will also share the same content. Open the main menu scene (0 Main Menu) and hit play. Walk to the backyard area and do some shopping. Now, you’ll be able to spend your hard earned gold on some fancy new stuff! 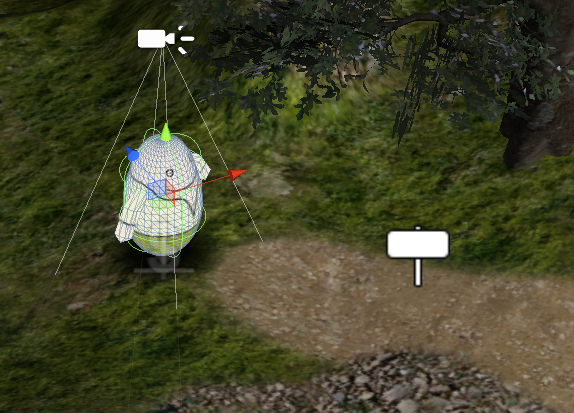 And that’s it for now – the next lesson will cover a changing NPC dialogue using object game variables.